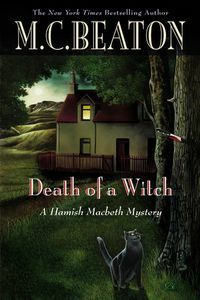 Death of a Witch by M. C. Beaton: Synopsis and Online Purchase Options. Synopsis (from the publisher): Returning from a foreign holiday, the redheaded Constable Hamish Macbeth senses a dark cloud of evil hanging over his Scottish village of Lochdubh. A newcomer, Catriona Beldame, has cast a spell over the town, and word of her magical powers spreads as fast as the Highland fog. The local men are visiting Catriona's cottage at all hours of the night and the women are outraged, ready to cast the witch into the sea loch. Hamish himself is charmed by her, too, until he begins to suspect that she is a danger to the town. The townsfolk simply don't believe that Catriona is a serious threat, saying that the loveless constable has turned against all women, and before he can prove them wrong, she is murdered. Catriona, in her own wicked way, curses Hamish from beyond the grave, making him the prime suspect in her murder case. Hamish will call upon the assistance of a pretty female forensic expert as he attempts to clear his name–perhaps he will find romance at last! Lochdubh's loyal constable won't give up until he can bring peace and quiet back to his beloved village.